Great Last Minute Father's Day Gift - Nothing Bundt Cakes! You are here: Home / Fun Activities For Kids (By Age) / Great Last Minute Father’s Day Gift – Nothing Bundt Cakes! Great Last Minute Father’s Day Gift – Nothing Bundt Cakes! Take the kids to Nothing Bundt Cakes and let them pick out a delicious, handmade bundt cake for their favorite “Bundt Man.” The Daddy-O cake comes with a special card and crayons so kids can add their own special message to Dad. 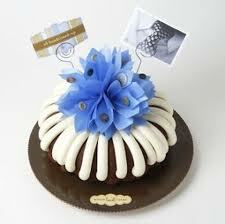 Other bundts perfect for dad include the Hole in One,  the All Bundt-oned Up  and the Real Men Don't Eat Square Cakes.  Come in before June 16 and enter Dad to win $500 worth of handyman services. Participating DFW locations include: Dallas, Rockwall, Frisco, McKinney, Flower Mound, Fort Worth and Southlake. Previous Post: « Family Fun Day & Open House at the Seay Child Care Center in Plano!